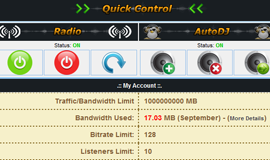 WHM Sonic is a Shoutcast Auto DJ Plugin for CPanel - and is the top choice among D.J. 's because of it's unique X-Fade feature. All WHM Sonic Packages come completly set up & streaming - you'll be able to easily upload your own MP3's with any FTP client. Switching from Auto DJ to Live Source is easy and is done by simply connecting with NO SERVER RESTART REQUIRED. Latest version now includes both SHOUTcast v1 and SHOUTcast v2 and high quality HTML5 player including album artwork which you can easily embed on your website. As of the latest version of WHMSonic, you can now use the popular DJ Feature built into WHMSonic in either mp3 or aac+format! Assign unique username/passwords for each of your DJ's, when they are ready to "go live" and begin broadcasting their live show, all then do is connect using the free Win Amp Broadcaster, Sam Broadcaster, LiveDJ, or most any other type of DJ Software. How does WHMSonic's Automatic Switching Feature Work ? WHMSonic will detect when a live source (live dj) has connected and automatically switch from auto dj to the live broadcast. When the dj is finished, all he/she must do is disconnect, WHMSonic will detect the live source has dis-connected and go back to the auto dj until the next dj connects. This is all 100% seamless for the listeners, if timed right, they can even tell the stream went from auto dj to live! Do you oversee two or more dj's and want to offer your listeners a 24/7 music option when no live dj is online? How Do My DJ's Connect to WHMSonic? You (as ADMIN), will need to create a custom username and password for each of your dj's. All dj's will be assigned the same ip address (host) and port number.